WHOLESALE DISCOUNTS AVAILABLE ON FULL LOADS - GREAT PRICES! CALL TODAY! 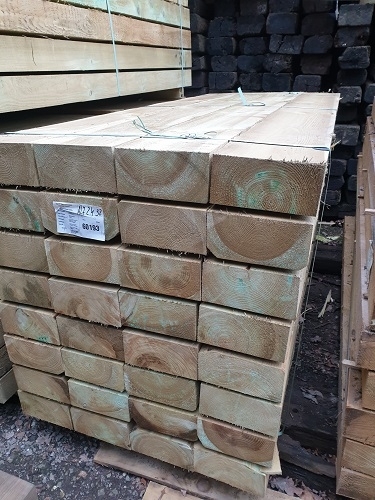 These good value eco friendly sleepers are the most popular of all our new railway sleepers. Frequently used for those wanting a crisp clean neat landscaping look, with the option of staining or changing colour. Great for gardening, as they are very simple to stack and construct with, not to mention lifting, drilling and cutting. Can look very architectural and stylish. Popular for steps, walls, raised beds, decking, ponds, furniture & areas where creosote treatment is unsuitable. They are FSC certified, which means they come from approved well managed forests. 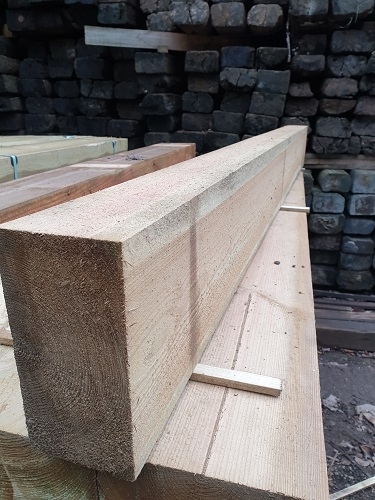 New softwood railway sleeper. Generally square cut and straight with very occasional waney edges. Light natural golden pine colour, that bleaches silver grey in the sun after 6 months or so. If you fancy a bolder darker colour, there is always the easy option of staining these sleepers with a multitude of colours that can be applied by brush, and are available in most DIY stores. 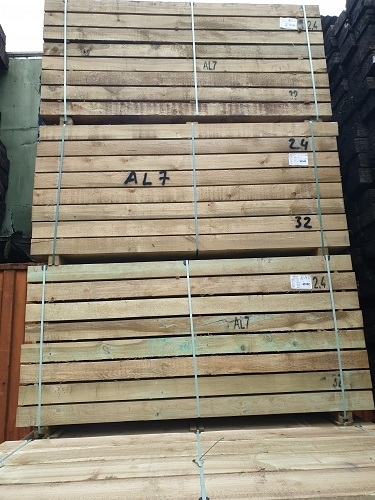 The lightest of all our railway sleepers, and considerably easier to lift than the hardwood railway sleepers. (Approx 35 kilos for a 2.4m x 200mm x 100mm length). Always bear this in mind when you are ordering a particular size of railway sleeper. 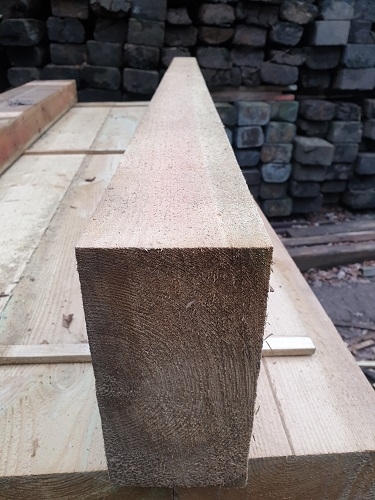 How do I plan to carry the railway sleepers into position? (e.g. the back of a garden). You'll normally need at least two willing people, with the possibility of incentives to sweeten the lifting process. Timberlok will screw through these railway sleepers without a pilot hole, so long as the drill is reasonably powerful. 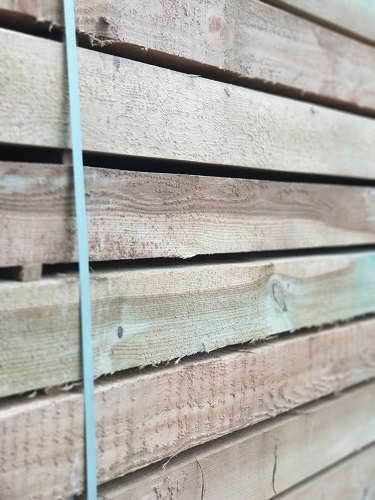 So no need to pre-drill, and connecting these sleepers together should be pretty quick and straightforward. ORDERING ONLINE; PRICE QUOTED IS FOR COLLECTION ONLY, PLEASE CALL 01202 579222 FOR DELIVERY QUOTE. Please note: We cannot give the driver details of where to place the item, nor will the driver take the item into a back garden, up a gravel driveway, across lawns etc. However, if you have a suitable hardstanding area such as a tarmac or concrete driveway, then the driver may be able to place it there at their discretion, but if not, then a kerbside delivery is all they are able to provide. We apologise for any inconvenience this may cause.